8:45 I was called to jury duty today. Enjoy the live screens and the chat room. 5/30/2008 1:53:57 PM Mountain TG:: I don't think you could count on that. Sometimes you get day after day of dullness. 5/30/2008 1:43:05 PM Mountain mh:: TG, due to the narrow range today, does it normally trend the next day? 5/30/2008 1:20:02 PM Mountain TG:: Out for 2. escaped with a small smile anyway. 5/30/2008 1:01:48 PM Mountain TG:: Crazy Harry is a clown, likes to send home lots of traders with a frown!!! 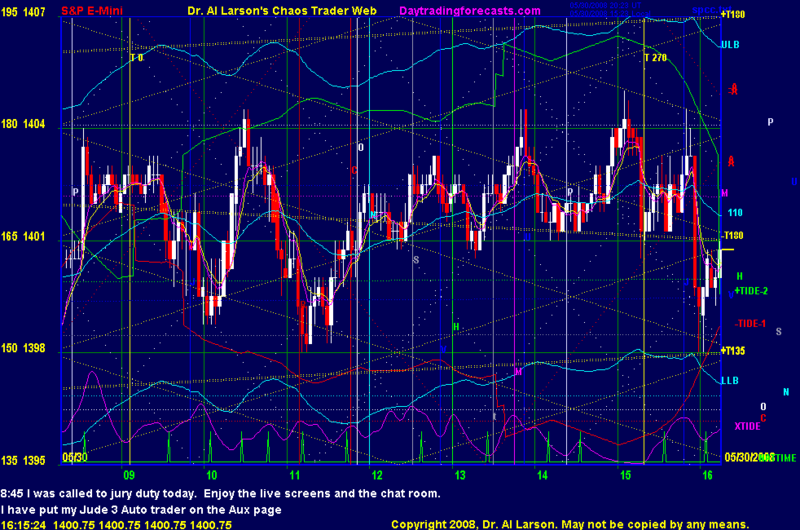 5/30/2008 12:40:47 PM Mountain TG:: finding some support on 50% retrace level and llc on potential 4 hr FOP. Still looks like 1407 or so at about 3:30 est. 5/30/2008 12:19:11 PM Mountain TG:: up fractal is bent but not broken yet so still hanging in there. I think it only projects to about yesterday's high though should it work. 5/30/2008 12:08:47 PM Mountain h:: frustrating day, -1.5 there. 5/30/2008 11:49:26 AM Mountain TG:: I think an up Fractal of Pi is underway from the 11:00 low. Looks like maybe a 4 hour one. Long from 1401.75, will look to exit around 3:00 timeframe. 5/30/2008 9:41:17 AM Mountain bm:: thank you very much for your answers, the thing is that al's materials on the public pages seems so dense and so good that I did not know by what to begin with. 5/30/2008 9:37:14 AM Mountain TG:: Personally, re: courses, I'd do Cash in on Chaos first and then Fractal of Pi. Very inexpensive and the progression of the material makes sense that way. Next do CTME. At that point, you have more than enough to figure out how to trade with an edge and develop trading rules around the material you learned. 5/30/2008 9:25:26 AM Mountain TG:: Yup, trendless. If there was a good day to be at jury duty this is it. 5/30/2008 9:25:11 AM Mountain RBI:: BM, after having taken all of Al's classes, I'd recommend you start with CTME. Then take it from there based upon how you like the material. You can never go wrong investing in your own education, so it doesn't matter all that much (IMHO) if you buy the courses all at once or purchase them one at a time. 5/30/2008 7:16:26 AM Mountain bm:: good morning mm, have a good day. 5/30/2008 6:56:19 AM Mountain Al:: GM all -good luck today. I'm off to jury duty.